Israel 25 Years after the Oslo Accords: Why Did Rabin Fall for Them? Precisely two decades after the failure by the Golda Meir government to identify a willing Arab peace partner triggered the devastating 1973 Yom Kippur war, another Labor government wrought a far worse catastrophe by substituting an unreconstructed terror organization committed to Israel's destruction for a willing peace partner. Instead of ending the Palestinian-Israeli conflict, the "Oslo peace process" between Israel and the Palestine Liberation Organization (PLO) created an ineradicable terror entity on Israel's doorstep that has murdered some 1,600 Israelis, rained thousands of rockets and missiles on the country's population centers, and toiled tirelessly to delegitimize the right of the Jewish state to exist. 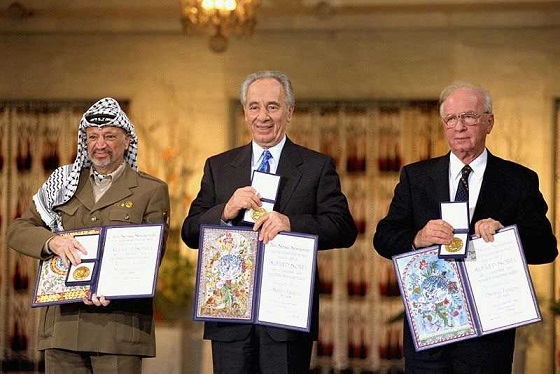 (Left to right): PLO chairman Yasser Arafat, Israeli foreign minister Shimon Peres, and prime minister Yitzhak Rabin accept the 1994 Nobel Peace prize in Oslo. Instead of peace, two of Israel's foremost security and foreign policy veterans created an ineradicable terror entity on Israel's doorstep. PLO chairman Yasser Arafat was a diehard man of war who made violence, dislocation, and mayhem the defining characteristics of his career. In 1970, he nearly brought about the destruction of Jordan. Five years later, he helped trigger the horrendous Lebanese civil war, one of the bloodiest conflicts in modern Middle Eastern history, which raged for more than a decade and claimed hundreds of thousands of innocent lives. In 1990-91, he supported the brutalization of Kuwait by Saddam Hussein, at an exorbitant cost to the Palestinians living there, thousands of whom were murdered in revenge attacks while hundreds of thousands more were expelled after Kuwait's liberation. In between these disasters, Arafat made the Palestinian national movement synonymous with violence and turned the PLO into one of the world's most murderous terror organizations with the overarching goal of bringing about Israel's demise. How, then, did the Rabin government come to believe in the instantaneous transformation of the man and his organization into dedicated agents of peace? In Northern Ireland, the decommissioning of weapons by all paramilitary groups was a prerequisite to the peace process. In the Oslo process, the Israeli government viewed the arming of thousands of (hopefully reformed) terrorists and their entrustment with enforcing law and order throughout the West Bank and Gaza as the key to peace and security. Where did this incredible delusion originate? discussion within the Labor Party, the cabinet, or the negotiating team about the final-status solution," Deputy Foreign Minister Yossi Beilin, Peres's longtime protégé and Oslo's chief architect told an inquiring reporter. "I cannot understand," demurred the astounded reporter. "In 1992, a government was elected. In 1993, you initiated the Oslo process. Yet at no stage you asked yourselves where all this was headed?" "And yet, when the cabinet approved the Oslo accord in a quick and superficial session, with almost no discussion, weren't you disturbed?" Peres was similarly delusional about the PLO's failure to abolish the clauses in the Palestinian covenant calling for Israel's destruction, as required by the Oslo accords. Thus, for example, when the speaker of the Palestinian National Council (PNC), the PLO's semi-parliament, conditioned the covenant's amendment on fresh Israeli concessions, Peres dismissed his demands out of hand. "We did not sign an agreement with the PNC speaker. We signed it with the PLO leadership and it is incumbent upon them to ensure its implementation," he argued, as if it were not the PNC that had adopted the covenant in the first place in 1964, revised it in 1968, and was the only body legally authorized to execute the required amendments. Small wonder that when Arafat informed him on May 4, 1996, that the covenant had been amended, Peres instantaneously lauded the alleged move as "the most important event in the Middle East in a hundred years" though it quickly transpired that no such amendment had actually taken place. Indeed, the covenant, with its plethora of articles calling for Israel's destruction, stands unrevised to this very day. When, in May 1994, Arafat told a closed meeting of Muslim leaders in Johannesburg that the Oslo accords were a temporary arrangement designed to bring about Israel's eventual demise, urging them to help spark a pan-Muslim jihad against Israel, Peres excused the comments as reflecting Arafat's tortuous adjustment to the new reality while Beilin brushed the remarks off as "silly words." In May 1994, Arafat told a closed meeting of Muslim leaders that the Oslo accords were a temporary arrangement designed to bring about Israel's eventual demise, urging them to spark a pan-Muslim jihad against Israel. 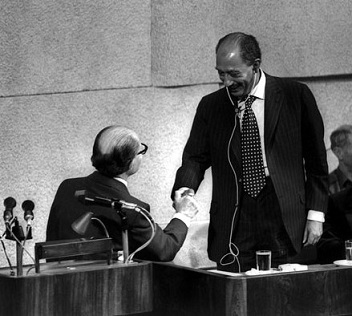 Egyptian president Anwar Sadat (right) shakes hands with Israeli prime minister Menachem Begin, Jerusalem, November 20, 1977. 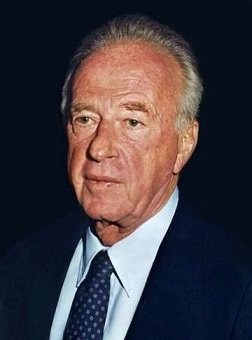 Following the signing of the Egyptian-Israeli peace treaty in March 1979, Rabin believed that the greatest remaining threat to Israel's national security was Syria and that a Syrian-Israeli agreement was also likely to pave the road for peace with Lebanon and the Palestinians. Twenty-five years and thousands of deaths later, with the Gaza Strip transformed into an entrenched terror entity and Israel experiencing horrific waves of terrorism as never before, there is no doubting the abysmal failure of this "test of blood." Yet rather than reconsider his disastrously flawed premises in the face of their horrendous cost, let alone follow his own pledge to stop the process in such circumstances, Beilin, like other "peace camp" acolytes, continued to willfully ignore the Palestinians' wanton violation of contractual obligations while blaming Israel for the stalled process. This, despite the public endorsement of the two-state solution by five successive Israeli prime ministers: Shimon Peres, Ehud Barak, Ariel Sharon, Ehud Olmert, and Benjamin Netanyahu. If Peres and Beilin's self-delusion can be partly explained, if not condoned, on ideological grounds, Rabin's behavior seems nothing short of the extraordinary. Unlike Beilin, he did not equate peacemaking and reconciliation with appeasement and self-flagellation; unlike Peres, he had no pipe dream of a budding "New Middle East." Rather he was a quintessential representative of the "activist" approach to the Arab-Israeli conflict dating back to Zeev Jabotinsky and David Ben-Gurion, which upheld that peace would only follow upon Arab realization of the inability to destroy Israel by force of arms. And since the March 1979 Egyptian-Israeli peace treaty had removed the largest and most powerful Arab state from the circle of war, Rabin believed that Israel's top strategic priority was to neutralize the remaining greatest threat to its national security: Syria. A Syrian-Israeli agreement, he reasoned, was also likely to pave the road for peace with Lebanon, long under Damascus's tutelage, and with the Palestinians, who would have no choice but to fall in line with their stronger Arab allies. 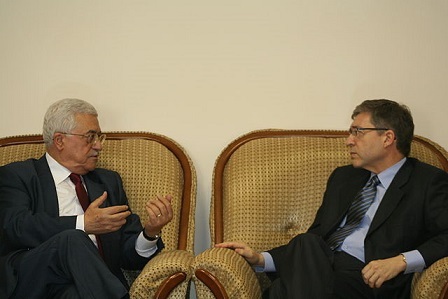 Yossi Beilin (right) with Mahmoud Abbas, then the PLO signatory for the Oslo accords. Rabin's lack of faith in Oslo was a corollary of his distrust of Shimon Peres and Beilin, whom he labelled "Peres's poodle." Why Rabin decided to abandon his astute approach to the Palestinian problem in favor of an agreement he deemed "a national disaster,"  brokered by colleagues he distrusted, and inextricably binding him to a partner he profoundly loathed, remains somewhat of a mystery. As with his initial decision to authorize the Oslo talks, this premise proved disastrously misconceived. Rather than navigate Israel's foreign policy in his own vision, as he famously pronounced in his victory speech on election night, he found himself skidding down a slippery slope into a process he would have rather avoided. He made his displeasure repeatedly known yet failed to take the necessary measures to stop the slide. 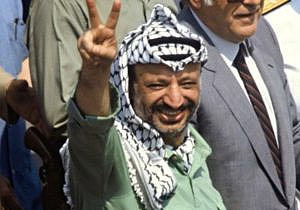 Instead, he developed the oddest excuses to justify his behavior, including the oxymoronic thesis of ensuring Palestinian compliance through noncompliance: Rather than demand the PLO's strict adherence to the accords, let alone publicly fault Arafat for noncompliance, Israel should seek to boost Arafat's position through accommodation (e.g., releasing larger numbers of imprisoned terrorists; allowing the return of West Bankers who had fled during the June 1967 war). When, in late October and early November 1993, three Israelis were murdered in terror attacks, one of them by Arafat's Fatah group, Rabin stated that he did not consider the PLO leader responsible for preventing terror attacks by "dissenting" Palestinian groups. The following month, Rabin announced that the IDF would preempt terror attacks from the Gaza Strip and Jericho after the evacuation of these territories, only to back down in the face of Palestinian protest and to assert that "there will be no thwarting of terrorist actions." A few months later, he took this concession a big step forward by telling the Knesset that terrorism was a natural outcome of the Oslo accords. He similarly excused the PLO's open pleading with the Arab states to sustain their economic boycott of Israel as an understandable negotiating ploy. Yet these warnings made no perceptible impact on the Palestinian leadership, not least since they were not followed by any meaningful sanctions. Thus, for example, not only did Arafat ignore Rabin's demand to retract his infamous Johannesburg incitement, but he publicly reiterated the same themes shortly after the original speech. When, in August 1994, Arafat failed to condemn the call for Israel's destruction by Farouq Qaddoumi, the PLO's perpetual "foreign minister," Rabin threatened not to sign the early empowerment agreement, stipulating the transfer of some forms of civilian authority in the West Bank and Gaza, only to back down and sign it on the designated date later that month. The interim agreement of September 1995 giving the PA control over 95 percent of the West Bank's Palestinian population (control of the Gaza populace had been transferred in spring 1994) was similarly signed despite the PLO's failure to amend the covenant or to stem terrorism. 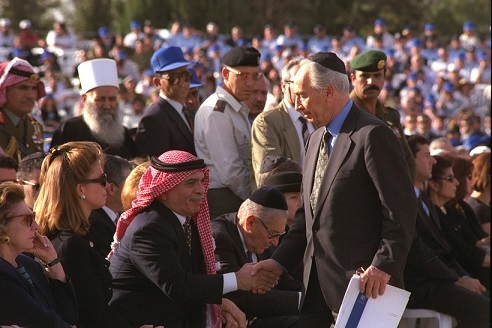 Shimon Peres (standing) shakes hands with Jordan's King Hussein during Yitzhak Rabin's funeral, November 6, 1995. Rabin did not embrace Oslo out of a burning desire for peace but was maneuvered into it by Peres, hoping that it would help consolidate Israel's security. It is doubtful whether Rabin would have indeed disengaged from Oslo in the rather unlikely event of his reelection (at the time of his assassination, he was trailing Netanyahu in most polls, in some by as many as thirteen points) —something that even Netanyahu found impossible to do. It is clear, however, that his perception of the broad contours of the final-status arrangement, as presented in his October 5, 1995 Knesset defense of the Interim Agreement he had signed the previous week, was far more restrictive than that of any of his successors, Netanyahu included. This approach probably makes the Oslo process the only case in diplomatic history where a party to a peace accord was a priori amenable to its wholesale violation by its cosignatory. There have, of course, been numerous agreements where one or both parties acted in bad faith. The September 1938 Munich agreement, to give a prime example, was conceived by Hitler as a "Trojan Horse" for the destruction of Czechoslovakia, a strategy emulated by Arafat fifty-five years later with the Oslo process. But while there was little Czechoslovakia could do given its marked military inferiority and betrayal by the international community, in Oslo, it was the stronger party that allowed its far weaker counterpart to flaunt the agreement with impunity—with devastating consequences that would haunt both sides for decades to come. Efraim Karsh, editor of the Middle East Quarterly, is director of the Begin-Sadat Center for Strategic Studies at Bar-Ilan University and emeritus professor of Middle East and Mediterranean studies at King's College London. Faisal Husseini interview, al-Arabi (Cairo), June 24, 2000. Yossi Beilin, interview with Ari Shavit, Haaretz Weekly Magazine, Mar. 7, 1997. "The Nobel Peace Prize 1994. Shimon Peres - Nobel Lecture," Nobleprize.org; Shimon Peres, The New Middle East (Shaftesbury: Element, 1993). Connie Bruck, "The Wounds of Peace," The New Yorker, Oct. 14, 1996. Shimon Peres, letter to the editor, The Jerusalem Post, May 21, 1996. Maariv (Tel Aviv), Sept. 25, 2001. Efraim Karsh, Arafat's War (New York: Grove Atlantic, 2003), pp. 77-83. Warren Christopher, Chances of a Lifetime: A Memoir (New York: Scribner, 2001), pp. 202, 204; The Jerusalem Post, Nov. 21, 1993; Arutz 7 (Beit El and Petah Tikva), Sept. 18, 2013. Avi Gil, Nushat Peres: Meyomano shel Shutaf Sod (Modiin: Kinneret, Zmora-Bitan, Dvir, 2018), pp. 146-8. "Results of Public Opinion Poll No. 25," Center for Policy Analysis on Palestine, Washington, D.C., Dec. 26-28, 1996, p. 14. "Palestinian Public Opinion about the Peace Process, 1993-1999," Center for Policy Analysis on Palestine, Washington, D.C., 1999; "New Beginning," U.S. News & World Report, Sept. 13, 1993. "Public Opinion Poll No. 31 - Part I: On Palestinian Attitudes towards Politics," Jerusalem Media and Communications Center, Mar. 1999, p. 3. Jacques Neria, lecture, BESA Center for Strategic Studies, Bar-Ilan University, Ramat Gan, Apr. 2017; see, also, Yossi Beilin: Lagaat Bashalom (Tel Aviv: Yediot Ahronot, 1997), p. 153. Gil, Nushat Peres, p. 297. Efraim Sneh, Nivut Beshetah Mesukan (Tel Aviv: Yediot Ahronot, 2002), pp. 22-3. "Jacques Neria: Rabin was a hawk - there would have been no agreement had he known Arafat's true intentions," YouTube, Jan. 8, 2017. Adam Raz, "Hazitot Mitnagshot: Haanatomia 'Hamuzara' shel Hakhraat Oslo shel Rabin," Israelim, Autumn 2012, pp. 126-8. Jacques Neria as cited in Israel Rosenblatt, "Moreshet Rabin - Zo Shelo Rotsim Shetakiru," News1, Dec. 10, 2016; see also Neria, Bein Rabin Le'Arafat: Yoman Medini 1993-1994 (Jerusalem: Jerusalem Center for Public Affairs, 2016), pp. 29, 88. Haolam Ha'ze (Tel Aviv), Oct. 13, 1993; Al Hamishmar, Nov. 16, 1993; The Jerusalem Post, Apr. 18, 19, May 27, 1994; Zeev Binyamin Begin, "Yasser Arafat's Lackey," The Jerusalem Post, Oct. 28, 1993; Zeev Binyamin Begin, "Revealing Mistakes," The Jerusalem Post, Dec. 26, 1993; Zeev Binyamin Begin, Sipur Atsuv (Tel Aviv: Yediot Ahronot, 2000), p. 77. See, for example, Al Hamishmar, Aug. 11, 16, Sept. 1, 1994; The Jerusalem Post, Oct. 14, 1994. Haaretz, Jan. 24, 29, 1995; Maariv, Jan. 24, 27, 1995; The Jerusalem Post, Mar. 5, 1995. Maariv Weekly Magazine, Apr. 13, 1995; Maariv, Apr. 16, June 7, 1995; The Jerusalem Post, Apr. 14, 1995. Maariv., Aug. 23, Sept. 13, 1995. Ibid., Oct. 1, 1995; The Jerusalem Post, Oct. 6, 1995. See, for example, Eitan Haber interview, Channel 7 News (Isr. ), Jan. 13, 2009; "Derech Rabin - Pinat Hashalom (interview with Itamar Rabinovich)," Yediot Ahronot Weekly Magazine, Oct. 1, 2015. "Derech Rabin - Pinat Hashalom." Beilin interview, Haaretz Weekly Magazine, Mar. 7, 1997; see, also, Beilin interview with Ofer Aderet, Haaretz, Oct. 23, 2016. "Dalia Rabin: My Father Might Have Stopped Oslo," Independent Media Review Analysis (IMRA), Oct. 13, 2010; Raz, "Hazitot Mitnagshot." The 376th session of the 13th Knesset's, Oct. 5, 1995. "Address by PM Netanyahu at Bar-Ilan University," Israel Ministry of Foreign Affairs, Jerusalem, June 14, 2009; "Speech by PM Netanyahu to a Joint Meeting of the U.S. Congress," Israel Ministry of Foreign Affairs, May 24, 2011. Gil, Nushat Peres, pp. 186-94. Maariv Weekly Magazine, Sept. 15, 1995; see, also, Beilin interview, Al Hamishmar, May 19, 1994.